My partner passed away Saturday, 10 February 2007 and he took a little bit of me with him. He was 13 years old. To me he was my best friend, my guardian and my partner. Devo is with his friends now, chasing his ball, or a cat, or spreading the trash around the floor looking for food even though he just ate. Not a minute goes by that I don’t miss his presence. I believe in time the sadness will be somewhat replaced by the wonderful memories of times we had together and the life we shared. Devo loved people, especially children. While this dog had an amazing capacity for love, he also had the heart of a lion. He did his job because he loved it. When I first saw Devo at the vendor he acted like he wanted to attack everyone he saw. He jumped nearly 6 feet straight up in the kennel as we approached: growling and barking. He passed all the tests with flying colors. When it was time to load him in the Veri-kennel for his ride to his new home, he bit one of the handlers, drawing his first blood! The other handler looked at me and said I was going to have “fun” when I got home and released him from his cage! In the car I sat next to him. Devo was growling and snarling at me through the cage. I kept thinking of that word “fun” the other handler had used! About half way home (on this six hour trip) we went through the drive thru at McDonalds, where I got a Big Mac. As I was eating I noticed something was different? The growling next to me was now replaced by a loud curious “sniffing”! I looked at Devo and decided to offer him a piece of hamburger. He growled as my hand approached, but gladly took the offered treat. I offered a second and a third. The growling stopped, the mad glazing eyes cooled and the tail began wagging. With help from McDonalds Devo and I began what was to be a life long friendship. When we got home it was “fun” letting him out of his cage and into my life. During Devo’s career he made many felony apprehensions. If suspects run, hide or try to fight the dog, they get a 75lb German Shepherd attached to them. Many of Devo’s apprehensions were made without bites. When they saw that big dog running full speed toward them they simply gave up. Many of them were so frightened by his appearance that by the time I caught up to where Devo had them they had the tell tale wet spot on the front of their pants and some had an unpleasant odor about them…. On one special call we were called to a code 3 cover call to assist SWAT in foot pursuit of a homicide suspect who was possibly armed. We were close by and arrived in seconds. I saw the SWAT officers in full gear with their m16s chasing the bad guy down the street. They were yelling “stop or we will shoot”. The bad guy kept running. I jumped from my car with Devo at my side and yelled “stop or I will send the dog!”. The suspect immediately stopped and laid down on the ground. The suspect later told me he was more afraid of the dog than getting shot! On another occasion Devo found a suspect who was hiding in the bushes. The suspect was holding a gun under his chest. The suspect said that when Devo bit him he forgot all about the loaded gun, possibly deterring any searching officer from getting hurt. 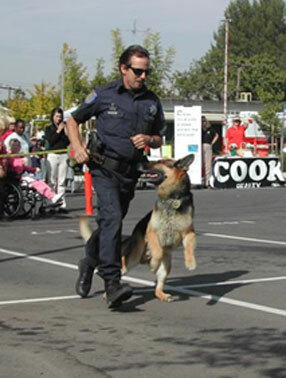 We will never know how many lives Devo saved by locating concealed bad guys, but we all felt safer with him out front searching, than by us stumbling along blindly looking for a hidden suspect. As Devo got older, he began to have trouble walking, especially after lying down for a while. He now was about 12 years old. One day he just collapsed on the floor and didn’t move. He was carried into the house and taken to the Vet and they took X-rays. They told us that Devo had arthritis in his spine. They gave us medicine for him and it did help some. I enjoyed working with Devo but what I will really miss is his companionship. It seems so unfair that such a wonderful animal has but a short time on this earth. The qualities that they possess by nature are so cherished by humans but rarely attained – unconditional love and loyalty to name two. My wife was with him when he passed; she was holding him, stroking his fur and talking to him. It deeply affected both of us but I am glad he didn’t have to go through it alone. This house will never be the same without him. His tombstone will read: “Rest In Peace my True Friend”.